With the world relying on technology and electronic systems, it has become imperative to protect the delicate components while shipping them. Every day hundreds of components are shipped to their destination where it is integrated into some system. These components need flexible and light weight packaging that is durable enough to withstand rough handling and also helps in keeping it free from dust and moisture. Our Re-Closable Zip Lock bags are great for packing small items that need superior protection and flexible packaging. Made from all-virgin LD polythene film, our ziplock bags provide the best mix of flexibility, durability and convenient packing and unpacking. The bags are tear-resistant and can bear a good amount of rough handling. The single-track zipper closure keeps out dirt and moisture, so you can be assured of the contents being provided superior protection throughout. The best thing about this packaging is that you can simply add a label to it and send the items straightaway. Once the contents have been put in the ziplock bags, you won’t need a lot of additional materials to secure it. One of the best things about zip lock bags is that they are made from transparent material. From a QC perspective, it becomes fairly easy for these packages to be checked and moved ahead without having to open the package for inspecting the products. This not only saves time, but also ensures that the package is not opened excessively and ultimately damaging the package . Even if it were to be opened, the zipper makes it pretty easy to open and close the package. The transparency in the packaging also allows for faster sorting of products without having to check the label or open the package. 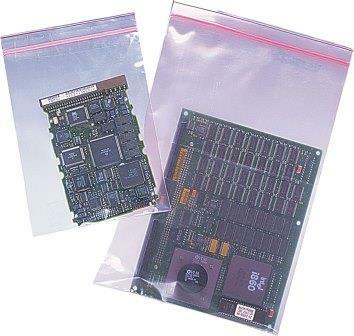 Storing fragile and sensitive electronic components may be the most common usage of zip lock pouches. But it can be used in several other ways also. You may put all the fresh produce in a zip lock bag and put it in the fridge to keep them fresh more. The same technique can be applied while storing meats. The zip lock pouches are excellent packaging material for spices due to the water resistant abilities of the material. Spice shops will find this packaging material very convenient, especially when they need to pack small quantities. The zip-lock bags work pretty well as piping bags also. Just fill it with the required material, make a small cut at the pointed end, and use it as a piping tool for creating awesome designs. Zip Lock Bags are available in different sizes to suit your specific needs. Browse our site anytime and from anywhere for a comfortable online shopping experience. Buy zip lock bags in India online at attractive prices and enjoy a hassle-free shopping experience.